At San Diego Comic Con this past weekend, we had the pleasure to meet with some of the talent behind one of our favorite animated DC shows: DC Super Hero Girls. Originally a YouTube series, the show’s been picked up by Cartoon Network. Because of that it’s going to start over, once again telling the story of Wonder Woman arriving from Themyscira to enroll in Super Hero High. The animation style – and, sadly, the super catchy theme song, *sniff* – will all change, but at its core, the show will remain the same. We love its steadfast focus on the sometimes-overlooked female superheroes of the DC canon, and its dedication to presenting them with humor and heart intertwined. Obviously there’s a huge amount of characters to choose from to include. So when deciding which characters make appearances, the team kept the above idea in mind. Unlike the YouTube series, the super girls will have secret identities, and Kluska discussed how a big theme of the show is “having a super life and a teen life.” Thus, the characters they pulled from comics canon are those whose stories and characteristics lend themselves well to that tension. We shared our idea of Lois Lane – who will be on the series – having a journalist friend named Iris West. Faust seemed to love the idea, so fingers crossed we might see it someday! As for Wonder Woman, Griffin reveals that she starts from the same place as in the YouTube series. She’s come to the school from Themyscira, which we won’t really see on the show, and is now struggling with the culture shock of it. According to Griffin, this Diana has “more of an exchange student feeling; she’s already kind of an awkward person because she’s so earnest.” So much of the fun of the character for Griffin this time came from playing with all of those layers of Diana’s awkwardness. Hearing all of this, we can’t wait until it’s time for the new series of DC Super Hero Girls to start. Unfortunately it doesn’t have an air date yet, but it will be on Cartoon Network soon. Stay tuned here for more information about its premiere, and for the release of our full video interviews with the creators and cast. 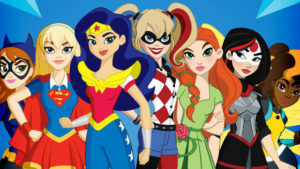 What are your thoughts about the new DC Super Hero Girls? Excited? Have some concerns about any changes from the YouTube series? Let us know in the comments below!